Click here for an article on Abner Kneeland. Click here for sample verses from the translation by Abner Kneeland. 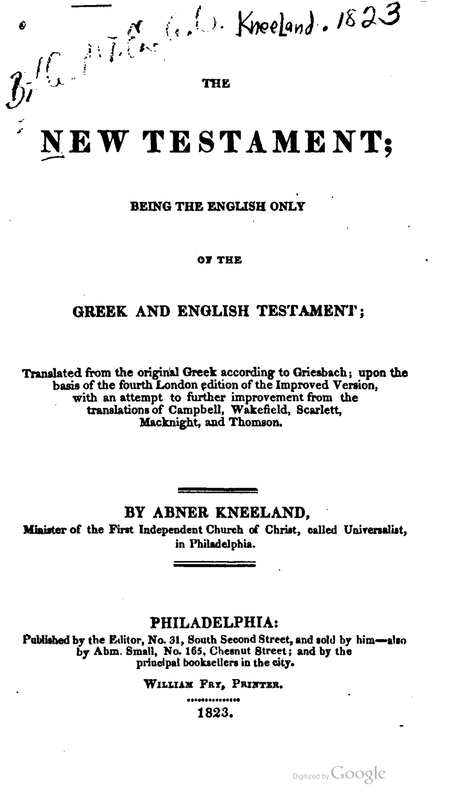 Title: The New Testament; being the English only of the Greek and English Testament; Translated from the Original Greek according to Griesbach; upon the basis of the fourth London edition of the Improved Version, with an attempt to further improvement from the translations of Campbell, Wakefield, Scarlett, Macknight, and Thomson. By Abner Kneeland, Minister of the First Independent Church of Christ, called Universalist, in Philadelphia. References: Herbert 1727, Hills 478; Chamberlin 544-4, Taliaferro-EELBV 7295.